Lush luxury at a glance is made even more inviting with the addition of plush velvet in an array of bold shades. The Brielle Velvet Sofa offers an element of old-world glamour without going over the top. A simple and sophisticated silhouette of straight lines and clean angles almost surprisingly frames the inviting softness of dense memory foam, while meticulous button-tufting details and uniquely shaped brass-tipped legs add an intricate yet casual elegance. With a vast array of velvet color options, the Brielle Velvet Sofa is not limited to a specific venue or scheme, but instead is a versatile seating piece for various motifs. Available in a variety of neutral or vibrant colors. Expertly crafted brass-tipped legs of solid wood. Padded cushions features a memory foam layer for added comfort. 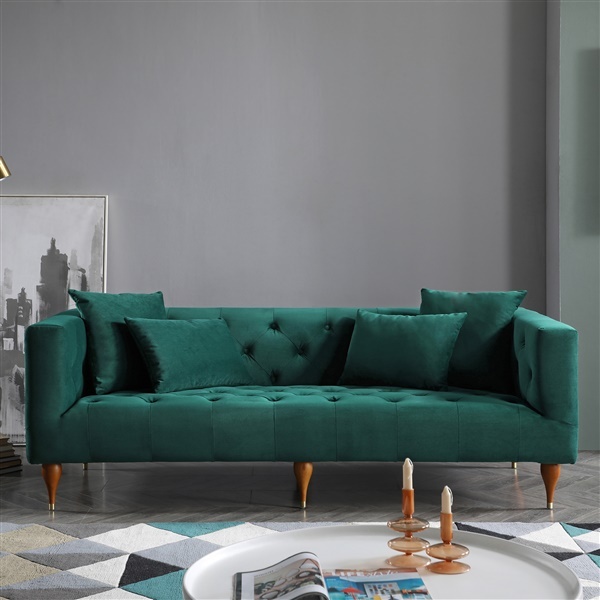 Upholstered in lush velvet with button-tufting detail. Emerald green with the medium / natural color of the feet make an exceptional color scheme and a blend I can only describe as royal and earthy - an unlikely combination that really works in my living room! Ultra spacious seating especially if you remove the pillows, i was actually able to use as a daybed when I had to think quick for an overnight guest, a stellar find! Luxurious especially in coral pink velvet! I was so happy to discover this website!! I will be coming back! My fiancé and I are very ecstatic about our recent inmod purchase. We've been shopping with inmod for about a year now and they never disappoint. ProsWe love the color and the frame. It was delivered quickly with no issues which can be nerve wracking. But it went great. Satisfied customers once again! I got so excited when I saw this sofa!! Between the shape, the ocean color, the legs and the price, there was nothing I didn't fall in love with right away. The ocean color against these legs is beautiful. Extremely satisfied with everything. I will definitely be back for more. Velvet is in guys! Got this great piece in the gray color and super happy with it all around. Great purchase.